First, the cockroaches. It appears my "killer cookies" worked. Well, actually, there is no telling if they worked because we also fogged twice and deployed about twenty different roach motels throughout the boat. It's safe to say one of these, if not the combo of all three, did the trick. It should be noted that I don't think we had a "major" infestation (if you turned on lights you didn't see them scurry away or anything and the roaches we saw were teeny tiny) but we have seen no trace of those nasty critters since moving aboard (and I've been looking under floorboards and all). Phew. I will fog once more before head north to Christmas country just in case there are any lying in wait to take over when we leave. Second, the solar panels. Many of you wrote requesting pictures of the finished project and here they are. They look great, don't they? I love solar panels. Soaking up the sun for energy! There's nothing better because there is LOTS of it where we are going. 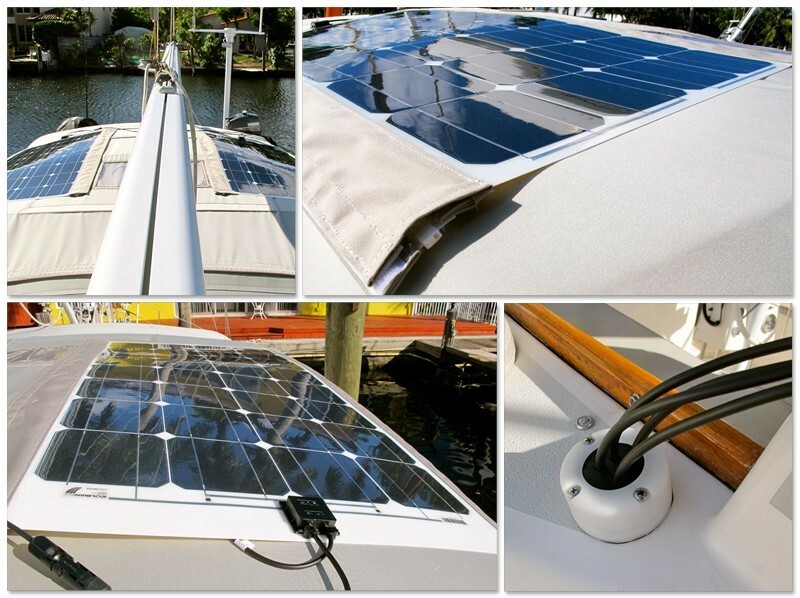 We have yet to really use these 125 watt flexible beauties in practice (we're still at the dock), but when we first plugged them in they were bringing in enough amps to run the basic systems of our boat on a cloudy, overcast day. We will keep you posted on how they work. We're planning on adding another 80-100 amps down the line, but these should be a great start for us. Lastly, baby Isla. She turned eight months this weekend and has been plagued with another cold (this is her second for those counting). This time it's a runny nose and a chesty cough. As if that's not enough, the poor little thing is cutting at least one top tooth which is no fun at all for her. She is gumming everything she can get her little hands on these days. Regardless, she is still her happy inquisitive little self. She is *this* close to walking, can now climb up a single stair, throws her arms in the air in "soooo big" fashion when you ask "how big is Isla?" and she loves - and I mean absolutely LOVES - peek-a-boo. She "dances" every time a peppy song comes on and squeals in delight at "Don't Worry, Be Happy" which is hilarious. We look at pictures of daddy each morning and she lights up like a Christmas tree every time she sees them which is so adorable. She is a super active baby, very thoughtful and happy and her smile? Well, it can melt your heart. Her giggle is music to my ears. She amazes me every single day. "Love" just doesn't describe it. Our davits are hopefully going to be installed this week and I have a few more items on my to-do list before we leave. Scott is doing great in the Caribbean and loving being at sea again. Every day I get a text from him stating how excited he is to start cruising as a family. Isla and I can't wait either! 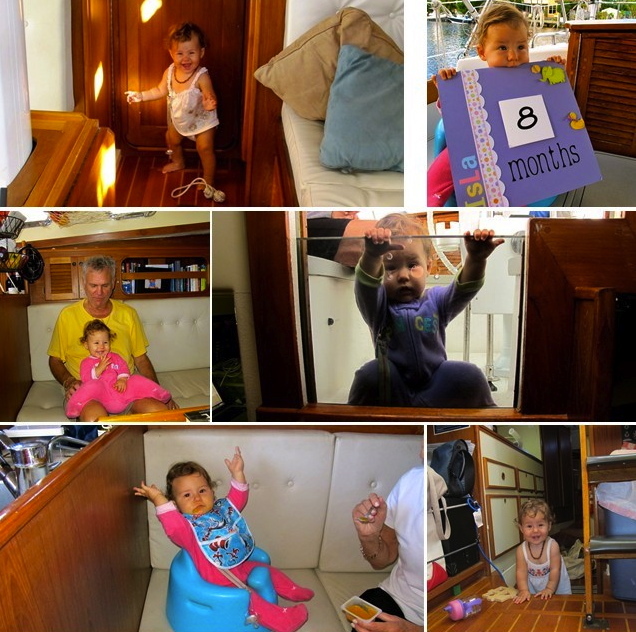 Your daughter is adorable and you are going to have so much fun cruising with her. I look forward to reading all about it. I would have died if I had found cockroaches!!! Your daughter is just too cute!